Welcome to my CDF/Cal Fire Registry History Page. My name is Jon Mills , and this is a short Historical perspective of my time with the organization. My Training, Assignments, Calls, Incidents and Adventures that I recall as vivid memories. My co-workers and friends often called me . I began as a Seasonal Firefighter at Elsinore FFS in 1974 with Fire Captains John Schaffer and Les Graham; FAEs Tony Alarcon, Gene Strand, Richard Lee and the only firefighter I remember is Dennis Zuzula. 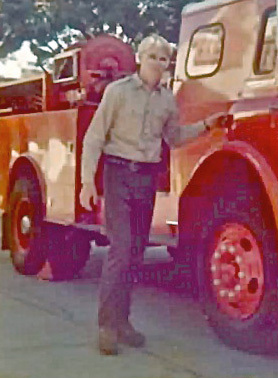 After being laid off the first of December I was hired as a Fireman CDF in Orange RU on May 1, 1975. In Orange I worked at Headquarters with Ken Sigsbee, Terry Olson, Carl Stadick, Tom O’Keefe, Jerry Chastain, Dan Shott, Jim MacMillan, Bill Pango (HFEO), and Dwayne Best . . . among others. After 6 months the city of Placentia went on strike and many of the personnel at headquarters were transferred to Placentia to staff the city stations. I worked there on the engine and the truck with many of the same people plus, Mike Fetchner, Dave Buck, George Pond, Mike Fink, Chuck Quirum, and Dennis Rickard. In October, 1977 I promoted to FAE in Riverside Unit and worked relief in the Perris Battalion, softly after being assigned to Nuview Sta 3. George McGuire was the captain at the time. It was a very SLOW assignment and I used to hate watching the engines from Perris roll by Station 3 to fires and honk at me so in 1980 I transferred to schedule B in Perris. Here I had the privilege of working with wonderful leaders such as Terry Schmutz, Jim Barta, Carl Stadick again, Bob Haydon, Dave Shuttleworth, Joaquin Silos, David Avila, and Kevin Ronco. I promoted to Fire Captain in 1983 and worked that season at West Riverside with Terry Olson, Jim Howeker, Mike Ritchey, Anna Anderson and Bob Innes. I spent fire season 1984 at Corona with Joel Semple, Mike Matta, Ray Schultz, Ed Augenfeld, and Tim Williams. The BCs during this time were Jim Bliss and Jan Newman. In 1985 I transfered to Oak Glen Conservation Camp where I spent the next 22 years loving the camp life. When I started working there Bob Linn, Tom Aiken, Lou Daniel, Marv Eaves, Clyde Chittenden, Bill Harkey, Andy Riley, Andy Doran, Randy Munoz, Paul Nees, Mike Robards, Ray Valenzuela, Paul Tremblay and Wiley Adams were the CDF staff. Over the years there were too many other great co-workers to list here. 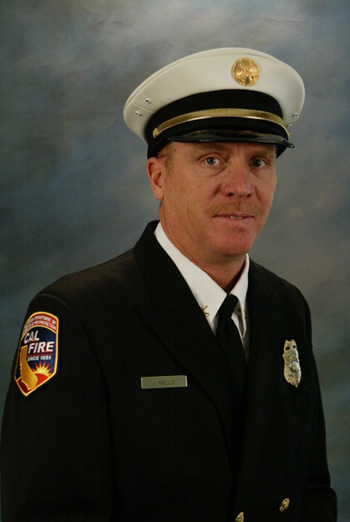 In 2007 I was privilaged to promote again to Battalion Chief at Oak Glen Conservation Camp and serve there for the next three years, retiring in 2010. By far my favorite assignment was Oak Glen Conservation Camp (it better be, I was there 25 years). I loved the variety of assignments and the freedom of taking a crew to remote work sites and the challenge of using inmate firefighters to work as a team and accomplish the impossible. There is no better feeling for me than working direct attack on a line of fire that goes up the hill out of sight, hearing the saws getting busy, feeling the pulaskis thumping the ground, seeing the scrapers working together and in the end catching the monster. Close behind Oak Glen was my time in Perris. Aggressive firefighting, very busy year round, first to be sent out of the county, great training in leadership from Terry Schmutz. For many years I was the Finance Section Chief on IMT #9. While most firefighters shun work in the Finance Section I found it a wonderful contrast to my “normal” assignment as a FC-B. Being a FSC allowed me many experiences most crew captains never have a chance to do. I worked several assignments out of state and in contract counties and even on Catalina Island. I met with the Director in Sacramento and many other, as we say in the camp, “Shot Callers” from many agencies. I found the challenges of negotiating Claims against the State and Cost Apportionment agreements very rewarding. While in Corona I took the crew one day, with Ed Augenfeld dressed in the Smokey suit, to the local children’s ward of the hospital to visit with the kids. While we were there we received a call of a grass fire at Green River and Hwy 91. We responded . . . with Smokey riding in the back . . . waving at the pubic all the way there. Upon arrival it was a small roadside grass fire and while the rest of the crew took action on the fire “Smokey” was standing on the engine pointing and giving directions with a shovel in his hand . . . I wish I could have taken pictures. There were times that were rough. I missed many important milestones and events in my family life. I was gone for long periods of time often without communication with loved ones. There were close calls and hair-raising times. I shudder to calculate how many miles are on my knees. Yet, it was 36 years of my life that, as I look back on it, I wouldn’t change a thing. When it was time to retire I never had that feeling of watching time go by slowly and not being able to wait until my last day. I was smiling even on the last day, enjoying the work. I guess the thing that makes it all worthwhile is the culture of CDF. The ethics of teamwork and team membership. Sweating with people who have your back. The strong bonds that develop as you face fear and danger with someone else and in the great tradition of CDF laugh and joke about it later.